Many viewers believe Brian Williams deserves a second chance on the "NBC Nightly News" -- but a significant portion don't think he'll be able to regain his credibility. That's according to a new survey by one of the media industry's leading consulting firms, Magid Associates, conducted in the wake of Williams' six-month suspension last week. Magid surveyed network news viewers and found that the "vast majority" are aware of the allegations against Williams, who apologized earlier this month for misstatements about an Iraq War mission in 2003. All of those surveyed said they tuned in for a nightly newscast at least once a month. Almost half -- 48% -- said they thought Williams can restore his credibility, 30% said Williams cannot regain credibility, and 22% said they were unsure. Among daily viewers of nightly newscasts, there was more support for Williams -- 58% of daily viewers said they thought he could earn his credibility back. "Viewers haven't overwhelmingly called for his firing and many of his viewers still support his return," said Jaime Spencer, a senior vice president at Magid. "But a lot can happen in six months," he said. "Right now most aren't seeing it as a career ender, but they're following the story and events can certainly change perceptions." To that point, perceptions may be affected by new revelations about Williams' exaggerations and by punchlines at the news anchor's expense. Sunday's "Saturday Night Live" anniversary celebration included a couple of televised jokes about Williams. 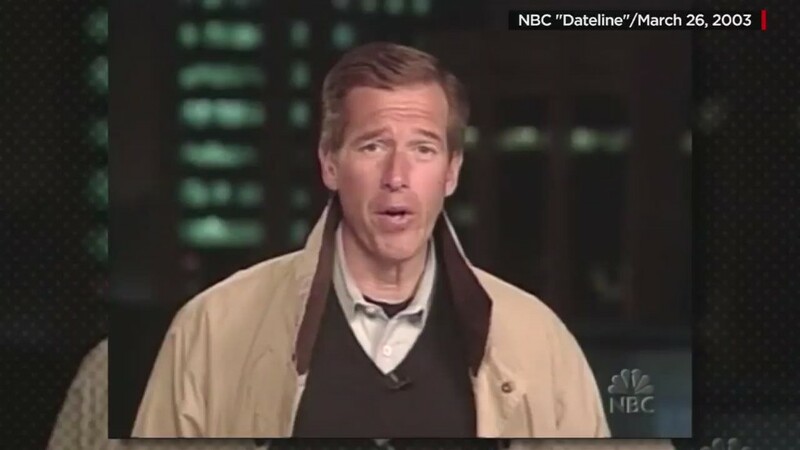 "Where are you hiding Brian Williams? Where is he?" the actor Jim Carrey asked. He added, "I just want to say something in his defense, okay? If the helicopter in front of me gets hit, I'm taking the story." Magid's online survey was conducted on Friday with 1,004 Americans ages 18 to 65 (meaning it skewed somewhat younger than the "Nightly News" audience as a whole). NBC News is not currently a client of Magid, but the consulting firm does work with other divisions of NBCUniversal. The survey found generational differences in the reactions to Williams' apology, the subsequent scrutiny of his reporting, and NBC's handling of it all. "Millennials are more likely to give Williams the benefit of the doubt," Spencer said, calling the finding noteworthy because "this generation will own the 25-54 demo for a long time to come, and they're most likely to give him a break." 44% of respondents said they thought NBC's punishment -- the six-month suspension without pay -- was "just right." Another 30% called it "too strong," and only 9% said it was "too weak." And "more than 80% of viewers have a positive or unchanged perception of NBC News' brand in the wake of the suspension," according to Magid's presentation of the survey results. So Williams has been hurt individually much more than NBC has been hurt institutionally. Magid also asked respondents about Jon Stewart's impending sign-off from "The Daily Show" and found that "in the eyes of viewers, Stewart's appeal transcends satire and comedy." In fact, "many see him as credible as mainstream network news journalists," according to the firm's presentation. 26% of "NBC Nightly News" viewers would welcome Stewart as a permanent replacement for Williams, according to the survey.